To avoid this problem, you must wander into the dark world of pointer casting, because once you are pointing at some data, Delphi no longer cares what its actual type is. Here’s an example of how to convert a Variant value into a generic type, including support for RTTI-free enums, in a reasonably type-safe way. This is part of a TNullable record type, which mimics, in some ways, the .NET Nullable type. The workings of this type are not all that important for the example, however. This example works with RTTI types, and with one byte non-RTTI enumerated types &mdash you’d need to extend it to support larger enumerated types. While I could reduce the number of steps in the edge case by spelunking directly into the Variant TVarData, that would not serve to clarify the murk. So what is going on here? Well, first if we are passed Null or “Empty” variant values, then we just clear our TNullable value. Finally, we find a modern TValue incantation suffices to wreak the type change for civilised types such as Integer or String. Sometimes it can be handy to test for design-time in a component unit when the component package is first loaded, e.g. within an initialization section, rather than when a component is created or registered. We use this to validate that runtime units that interoperate with a component are linked into a project, and raise an error as early as possible if they are not. As per several QC reports, Data.DBXJSON.TJSONString.ToString is still very broken. Which means, for all intents and purposes, TJSONAnything.ToString is also broken. Fortunately, you can just use TJSONAnything.ToBytes for a happy JSON outcome. Because TJSONString.ToBytes escapes all characters outside U+0020-U+007F, we can assume that the end result is 7-bit clean, so we can use TEncoding.ANSI. You could instead stream the TBytes to a file or do other groovy things with it. Today I’ve got a process on my machine that is supposed to be exiting, but it has hung. Let’s load it up in Windbg and find what’s up. The program in question was built in Delphi XE2, and symbols were generated by our internal tds2dbg tool (but there are other tools online which create similar .dbg files). As usual, I am writing this up for my own benefit as much as anyone else’s, but if I put it on my blog, it forces me to put in enough detail that even I can understand it when I come back to it! 0764aa14  00000928 01200125 004b8472 000037ce  (...%. .r.K..7..
Now one of these should correspond to a TMonitor record. The first entry (01a8ee74) is just part of our TSyncEventItem record, and the next three don’t make sense given that the FSpinCount (the next value in the memory dump) would be invalid. So let’s look at the last one. Counting quickly on all my fingers and toes, I establish that that makes 08a47538 the start of the TMonitor record. And… so we search for a pointer to that. 076b1d24  08a47538 08aa3e40 076b1db1 0122fe50  [email protected]>....k.P.". Just one! But here it gets a little tricky, because the PMonitor pointer is in a ‘hidden’ field at the end of the object. So we need to locate the start of the object. Ta da! That all fits. A TObject has no data members, so the next 4 bytes should be the TMonitor (search for hfMonitorOffset in the Delphi source to learn more). So we have a TObject being used as a TMonitor lock reference. (Learn about that poi(address-38)+1 magic). But what other naughty object is hanging about, using this TObject as its lock? Just one. Let’s trawl back in memory just a little bit and have a look at this one. And what does a TThreadList look like? Yes, that definitely looks hopeful! That FLock is pointing to our lock TObject… I believe that’s called a Quality Match. This is still a little bit too generic for me, though. TThreadList is a standard Delphi class used by the bucketload. Let’s try and identify who is using this list and leaving it lying about. First, we’ll quickly have a look at that TThreadList.FList to see if it has anything of interest — that’s the first data member in the object == object+4. Yep, it’s a TList. Just making sure. It’s empty, what a shame (TList.FCount is the second data member in the object == 00000000, as is the list pointer itself). So how else can we find the usage of that TThreadList? Is it TThreadList referenced anywhere then? Break out the search tool again! Yes. Just once, again. Again, we scroll back in memory to find the base of that object. That suggests that the object has already been destroyed. But that the TThreadList hasn’t. And sure enough, when I looked at the destructor for TAnatomyDiagramTileLoadThread, we clear the TThreadList, but we never free it! Now, another way we could have caught this was to turn on leak detection. But leak detection is not always perfect, especially when you get some libraries that *cough* have a lot of false positives. And of course while we could have switched on heap leak detection, that involves rebuilding and restarting the process and losing the context along the way, with no guarantee we’ll be able to reproduce it again! While this approach does feel a little tedious, and we did have some luck in this instance with freed objects not being overwritten, and the values we were searching for being relatively unique, it does nevertheless feel pretty deterministic, which must be better than the old “try-it-and-hope” debugging technique. I am happy to announce that the missing characters have been found! Last year I published a blog post about characters missing from print jobs with Internet Explorer 9 and my adventures in tracing and reporting the issue to Microsoft. Today, I was notified that Microsoft have finally publicly published a hotfix! We received the hotfix from them a few weeks ago, before it was publicly available, and it certainly solved the problem on our test machines and end user computers. Sadly, they’ve only published a solution for Windows 7 Service Pack 1 onwards, and not for Vista, which could be an issue for some users. This issue occurs because a conflict causes the text that uses the font to become corrupted when the two threads try to install the font at the same time. The name of the font is generated by the RAND function together with a SEEDvalue whose time value is set to srand(time(NULL)). When the two documents are printed at the same time, the SEEDvalue for the font is the same in both documents. Therefore, the conflict occurs. When refactoring a large monolithic executable written in Delphi into several executables, we ran into an unanticipated issue with what I am calling the fragile abstract factory (anti) pattern, although the name is possibly not a perfect fit. To get started, have a look at the following small program that illustrates the issue. What happens when we run this? Exception EAccessViolation in module FragileFactory.exe at 000495A4. Access violation at address 004495A4 in module ‘FragileFactory.exe’. Read of address 00000000. Note the missing TRedClass in the source. We don’t discover until runtime that this class is missing. In a project of this scale, it is pretty obvious that we haven’t linked in the relevant unit, but once you get a large project (think hundreds or even thousands of units), it simply isn’t possible to manually validate that the classes you need are going to be there. Delphi use clauses are fragile (uh, hence the name of the pattern). The development environment frequently updates them, typically they are not organised, sorted, or even formatted neatly. This makes validating changes to them difficult and error-prone. Merging changes in version control systems is a frequent cause of errors. When starting a new Delphi project that utilises your class libraries, ensuring you use all the required units is a hard problem to solve. There will be an external source for the identifiers. In the project in question, these class names were retrieved from a database, or from linked resources. The registered classes will be iterated over and each called in turn to perform some function. Of course, this is not a problem restricted to Delphi or even this pattern. Within Delphi, any unit that does work in its initialization section is prone to this problem. More broadly, any dynamically linking registry, such as COM, will have similar problems. The big gotcha with Delphi is that the problem can only be resolved by rebuilding the project, which necessitates rollout of an updated executable — much harder than just re-registering a COM object on a client site for example. How then do we solve this problem? Well, I have not identified a simple, good clean fix. If you have one, please tell me! But here are a few things that can help. These are not assertions that are likely to fail but they do serve to ensure that the classes are linked in. The AssertMyClassRegistry function is called in the constructor of our main form, which is safer than relying on a use clause to link it in. Units that can cause this problem can be identified by searching for units with initialization sections in your project (don’t forget units that also use the old style begin instead of initialization — a helpful grep regular expression for finding these units is (?s)begin(?:.(?!end;))+\bend\.). This at least gives you a starting point for making sure you test every possible case. Static analysis tools are very helpful here. Even though it goes against every encapsulation design principle I’ve ever learned, referencing the subclass units in the base class unit is perhaps a sensible solution with a minimal cost. We’ve used this approach in a number of places. Format your use clauses, even sorting them if possible, with a single unit reference on each line. This is a massive boon for source control. We went as far as building a tool to clean our use clauses, and found that this helped greatly. In summary, then, the fragile abstract factory (anti) pattern is just something to be aware of when working on large Delphi projects, mainly because it is hard to test for: the absence of a unit only comes to light when you actually call upon that unit, and due to the fragility of Delphi’s use clauses, unrelated changes are likely to trigger the issue. Just a quick exception management tip for today. I was debugging a weird cascade of exceptions in an application today — it started with an EOleException from a database connection issue, and rapidly degenerated into a series of EAccessViolation and EInvalidPointer exceptions: often a good sign of Use-After-Free or Double-Free scenarios. Problem was, I could not see any place where we could be using a object after freeing it, even in the error case. CauseADatabaseException;  // yeah... bear with me here. I must admit I read through the code quite a few times before I spotted it. It’s not an in-your-face-look-at-me type of bug! In fact, the line in question appears to be completely logical and plausible. 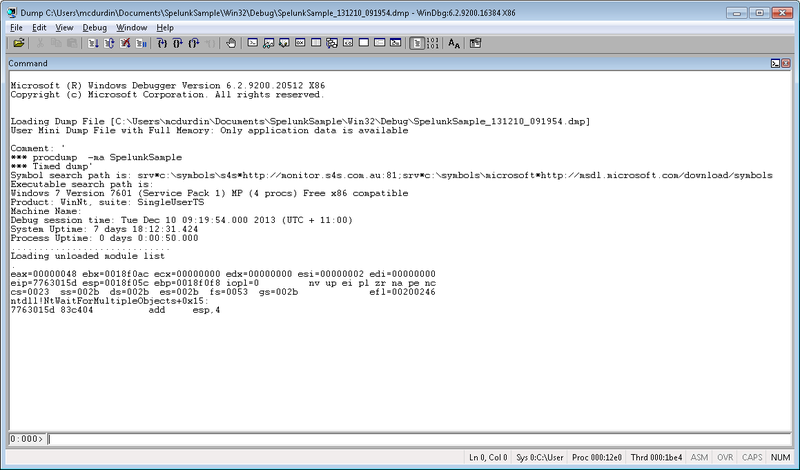 When we call raise(E) we are telling Delphi that here is a shiny brand new exception object that we want to raise. After Delphi raises the exception object, the original exception object is freed, and … wait a minute, that’s the exception object we were raising! One delicious serve of Use-After-Free or Double-Free coming right up! raise;  // don't reference E here! Another thing to take away from this is: remember that you don’t control the lifetime of the exception object. Don’t store references to it and expect it to survive. If you want to maintain knowledge of an inner exception object, use Delphi’s own nested exception management, available since Delphi 2009. Have you ever written any Delphi code like the following snippet? 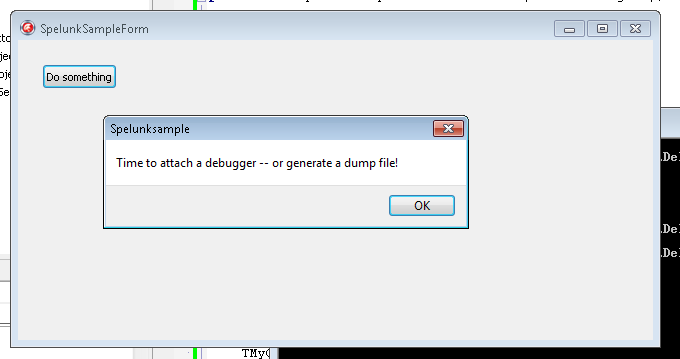 That is, have you ever raised a Delphi exception in a Win32 callback? Or even just failed to handle potential exceptions in a callback? // Win32 code. You need to write the HandleAllExceptions function! Why does switching languages hang my app? This is a very short follow-up to yesterday’s blog about WM_INPUTLANGCHANGEREQUEST, WaitForSingleObject and applications hanging. While I thought, yesterday, that this bug was no longer such a problem on Windows Vista and Windows 7, it turns out that if you assign a hotkey to a language (e.g. Alt+Shift+2), the KLF_SETFORPROCESS flag will be set when that hotkey is pressed. This means that this issue is still a problem today. This is not just a problem for Delphi. I’ve found references to Outlook hanging, .NET 4.5 WPF applications hanging, and VC++ applications hanging.